One of the most sought after topographical maps produced by the U.S. Geological Survey. The 1898 edition of the U.S.G.S. 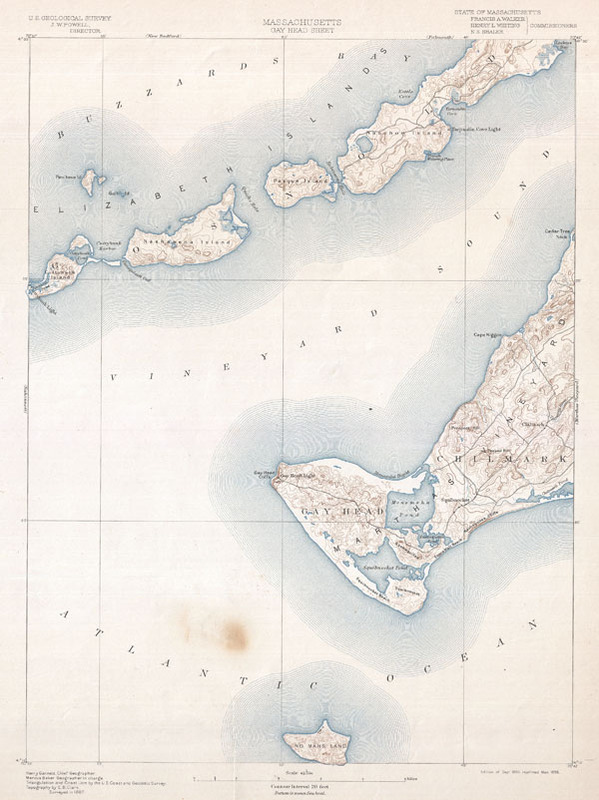 Survey Map of Gay Head, Marthas Vineyard covers the Western part of the island including Gay Head and Chilmark. Also covers parts of Buzzard Bay and the Elizabeth Islands of Cuttyhunk, Nashawena, Pasque, and Naushon. Identifies topographical features such as Squibnocket Beach, Prospect Hill, the Nashaquitsa Cliffs, Stone Wall Beach, Peaked Hill, the Tiasquam River, and others. Notes the various roads traversing the region. Names the Gay Head Lighthouse, the Tarpaulin Cove Lighthouse, and the Cuttyhunk Lighthouse. Prepared by Henry Gannett, E. B. Clark and Marcus Baker in 1887. Rumsey 2883.043. Phillips (Atlases) 1801. LeGear, Clara Elgi, United States Atlases, L1552.